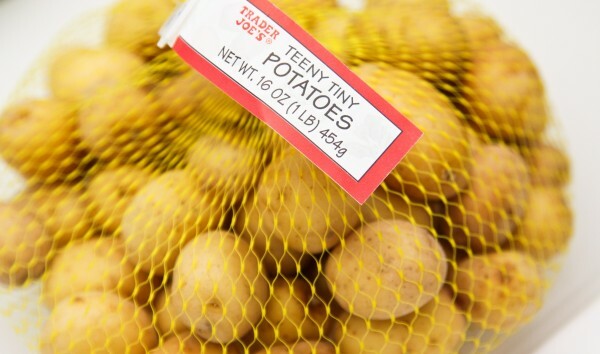 I wanted to make a really simple potato side dish and decided to use the “Teeny Tiny Potatoes” from Trader Joe’s, but Fingerling or Baby Golds would work well too. Just need small potatoes with a thinner, smooth skin. So just put them in a roasting pan with whatever seasonings you like, toss, and turn heat up around 450*, and even possibly higher as long as you are careful not to let them burn. **Try to somewhat match the flavors of the potatoes to your main dish so they aren’t competing. Smash them up when they are tender (leave it a bit chunky), and then add in some oil/butter, milk/cream, sour cream/marscapone, or even a little buttermilk until it gets to the consistency you want. Check seasonings, add if necessary and then serve.